A new website for Fireplace City and a toasty new colour scheme helped us give their company logo a warm through too. 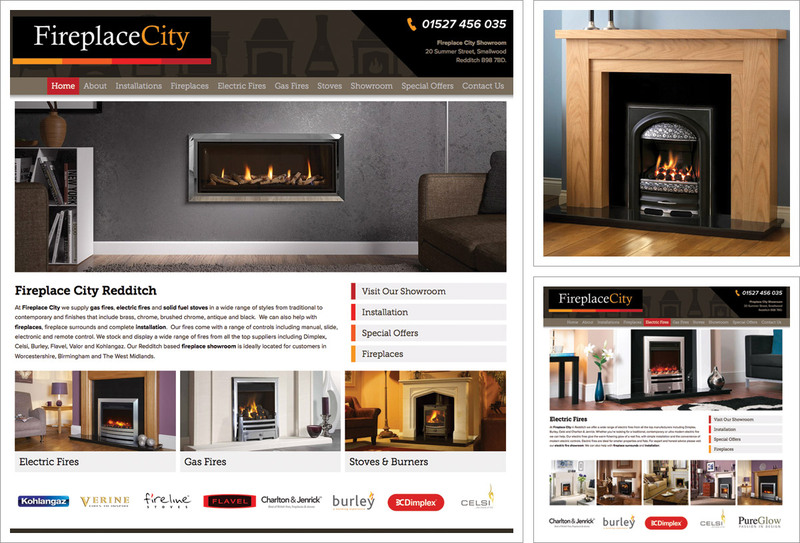 The new website for Redditch based Fireplace specialists Fireplace City is responsive and mobile friendly which means it displays well and is easy to navigate on desktops, laptops and mobile devices such as tablets and mobile phones. The website has been designed with intuitive navigation options to include a horizontal menu, a further contextual menu on each page and links placed on images and manufacturer logos. The website is expandable and may be developed further in the future if required. Good on-page optimisation techniques have been used including unique relevant on-page text content and use of keywords and phrases on-page and in the supporting alt image tags and meta description and title tags. A combination of manufacturers images and Fireplace City showroom photos have been used across the site. Dynamic content on the homepage in the form of a changing image holder.